Editor’s Note: Every Wednesday at 10:30 am CT (please note the new time! ), Adam and Lindsey host a live Girardian Virtual Bible Study following the Sunday lectionary on the Raven Foundation Facebook page. We invite our listeners to join the conversation with comments and questions. I take some notes to help me prepare… and share them with you to help you do the same! This is the Girardian Virtual Bible Study preview! The cross looms ahead of us, and this week’s lectionary, John 12: 1-11, brings us closer to the revelation of God’s extravagant love – reflected in Mary’s scandalous generosity – juxtaposed against humanity’s imposition of blame and cruelty. This passage contains layers upon layers of scapegoating and misappropriated blame, but cutting through it is truth, beauty and compassion. Jesus has seen how God’s commands to welcome and love strangers and foreigners have been neglected. He has seen instructions on forgiveness of debts ignored and the further entrenchment of poverty through the generations. He has seen how people and nations have defined themselves over and against others and how claiming the exclusive favor of an exclusive God has pushed out scapegoats within communities and fostered enmities between them. Poverty that results and metastasizes from these patterns of human behavior is something Jesus intimately understands precisely because he has placed himself at the center of it. The same forces that impoverish ultimately kill Jesus. So when Jesus says, “You always have the poor with you,” he is lamenting, not acquiescing to, human sin – which can be summed up as the brokenness of human relationships that compels us to find our identities over and against, rather than with and for, one another. Yes, there is so much more in this action, in this anointing for burial as both preparation for death and the beginning of death’s undoing itself – the undoing of the victimization and ritualization that grafts sacrifice into the lifecycle of communities and destroys them from the inside out. The Girardian Lectionary has a powerful notes from Gil Bailie’s lectures on this passage that further illuminate these verses. What I find particularly striking, however, is poverty as a consequence of the dehumanization that is pinpointed against a single individual or group in the scapegoating mechanism, as the widespread result of scapegoating from the foundation of the world. Because in an age and a society where the poor are still scapegoated, and violence – in the form of destruction of social programs and the diversion of funding to wars that further entrench poverty – violence that harms the poor is whitewashed and cloaked in pseudorighteousness, I believe we must see the social and political dimension of Jesus’s words, as well as the personal. At the core of it all, to say “You always have the poor with you,” is to say that the fullness of humanity is always denied. And that will only change when we see the Fully Human One right before our eyes. That is why Jesus draws the focus back to himself; ultimately to affirm the dignity of everyone and to show us that dignity that we may see it in ourselves and others. If we see poverty itself through the lens of scapegoating, we can see how this passage presents further layers of scapegoating as well, layers that can lead to marginalization and poverty. Judas scapegoats Mary. 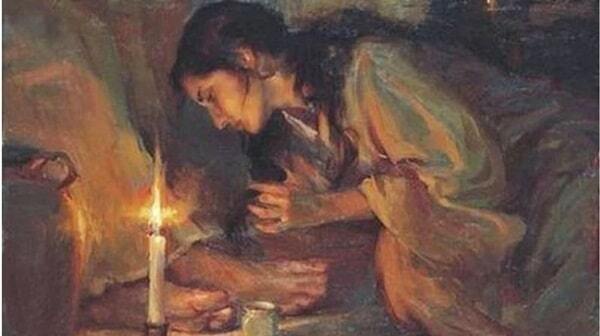 He chastises her for her extravagant generosity as she spreads the perfume over Jesus’s feet. The chief priests scapegoat not only Jesus, but Lazarus as well, “since it was on account of him that many of the Jews were deserting and were believing in Jesus.” Fearing loss of authority and power, and fearing destruction of their community by Rome, they conspire to put Lazarus to death… again. And generations of Christians have scapegoated Jews because of an anti-Semitic reading of this text. If we set Jesus apart from every other victim and see his execution as something unique and more offensive than that of anyone else, we miss his solidarity with the victims of violence in all times and places, and we mistake the violence done against him as worse than our own. Beyond Scapegoating: Come Join the Conversation! But, I fear I have already said too much. These previews are meant to entice, not give everything away. Because we want you to come and join our discussion. And yet, the richness – not only of the text, but of the human history and culture that it illuminates, from the foundation of the world until today – beckons me to further explore, and writing is my journey. So, I hope you are intrigued to journey with us. What stands out to you among these scriptures? 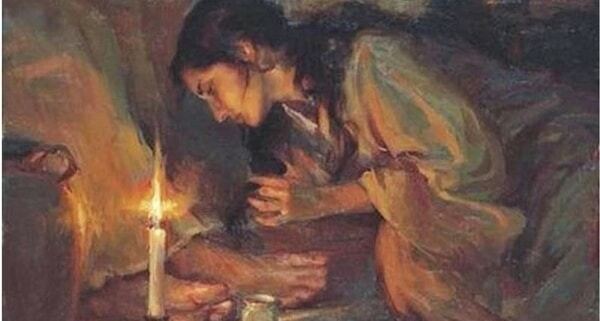 How do you interpret Jesus’ words about the poor, or Mary’s extravagant generosity, or Judas’s chastisement, or the reaction of the chief priests? And if “we always have poor among us,” what does that mean in light of the prayer that God’s will be done on earth as in heaven? What does Jesus have to say to today’s social and political and economic systems? What does he have to say to the ways we see, or don’t see, those who are poor among us? What hope does he offer the poor themselves, who comprise the majority of the world? Come and join us as we dive into some of these questions, or bring your own questions or comments. Let us be challenged and nurtured together. Image: Available on Wikimedia via Creative Commons Attribution-Share Alike 4.0 International license. Image cropped.